PULASKI – The culmination of spirit week at Pulaski High School included an academic kickoff and a competitive pep fest. 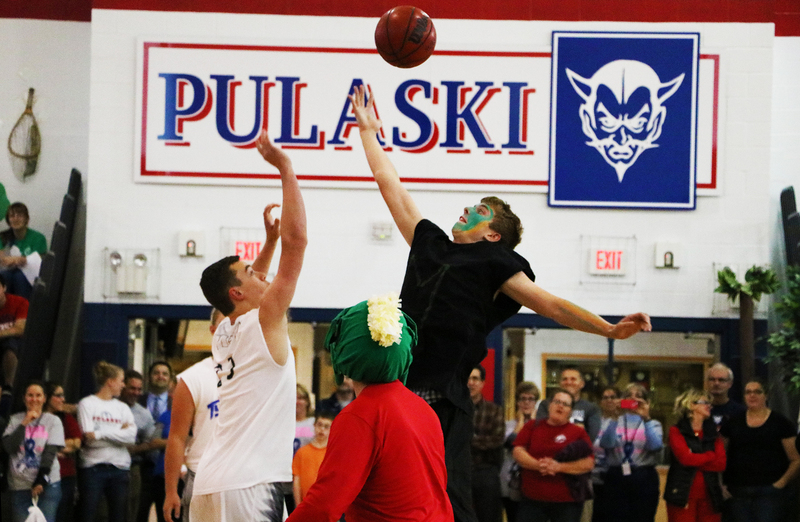 The Space Jam Seniors perform the last scene of the movie “Space Jam,” which is a basketball competition between Looney Tunes characters and monster aliens, as their skit competition for the Pulaski High School Pep Fest. Principal Michael Bateson recognized academic and personal achievement during the academic kickoff. Awards such as the Snow Incentive Award were distributed to students who demonstrated character and citizenship. Bateson shared a tale of “Two Wolves,” a Native American Cherokee legend, in which a grandfather tells his grandson of the battle that goes on inside all of us between good and evil. Bateson encouraged the students to remember this story and to never stop pursuing personal greatness. “Accept responsibility for your own education. It’s about you working towards being a better you every day,” said Bateson. Only 16 points separated the first from the last class at the beginning of Pep Fest. The Freshwater Freshmen, the Shiver Me Timber Sophomores, the Star Wars Juniors and the Space Jam Seniors all competed for the best spirit float and the best skit. The seniors proved winners of the Spirit Salmon with 211 points. Juniors followed with 185 points, sophomores with 172 points and freshmen with 157 points.